These are my dogs. Don’t let their sweet, innocent faces distract you- they are not sweet and innocent at all. When they don’t get their way they are like teddy bears that have come to life and scream and have very sharp teeth and claws. There is a special term called the “Shiba scream”. Trust me, people were not kidding around when they made up a special term for this. It’s like nothing you’ve ever heard. When we lived in an apartment, we were afraid dog control would show up when we brought out Kuma’s nail clippers. Anyway. All of that to say, Shiba Inus are very smart and can be easy to train. If they want to learn something, no problem. If not, well… good luck to you. You will be subject to shrieking, thrashing, and general theatrics worthy of an Oscar. Riley is 5 1/2 months old now. We have had her for 2 1/2 months, and started immediately on a few things to establish a routine and pack order: crate training, sit, and house training. Crate training was the easiest, and she really only cried for a few nights (her crate is in our bedroom, and she won’t have to sleep in it forever- just until she can be trusted to not eat everything she sees and kill herself). Sit took several weeks, but she finally got it! Once she had it, we kept reinforcing it every time she got treats, when she gets fed, before she goes outside, etc. It’s the most basic command, so I wanted to know that she had it down. Then we went to lay. She doesn’t care for it. I think it’s because she has to lay all the way down and it’s submissive, but obviously I’m not sure. It only took her about two weeks to learn lay. Check out how cute she is! House training was a big strain on the whole household. We thought it would be easy. We were mistaken. Neither of us had ever raised a puppy (we decided as children doesn’t count. the adults do all the work! ), and we read everything we could find. In a fashion that I can only assume is similar to raising a child, it seemed a lot easier on paper. I would take her out every half hour, but she still would pee all over the floor with no warning- even when she had gone outside! We have wood floors, but she also managed to ruin every throw rug in the house that couldn’t be washed. Pee pads didn’t work, taking her outside didn’t work- I was so frustrated that I wasn’t able to communicate with her. I had heard of using a dog bell, but it seemed so ridiculous and annoying. I knew she would ring the bell every time she was bored, and probably not when she needed to. Weeeellll… in a fit of desperation, I got these bells from Amazon (this is an affiliate link- if you buy this I will get a small percentage. I bought these myself!). They have directions on how to train the dog to use the bell, but I skipped several steps (she is a fast learner when she wants to be, I’m telling you…). She learned in one evening. That was two weeks ago, and she has only had one accident since (before 5-7 a week was not unusual). She rings the bells a lot, but it’s far preferable to the alternative. She thinks it’s a fun game ringing the bells and watching people come running to cater to her. Try it with your puppy if you’re getting desperate- I think they are miracle bells. Oh my goodness, that’s such a lot of training! You are a SAINT! I bet it results in some amazing relationships with your dogs, though. Lol thanks! I am pretty sure I’m not a saint at all. But I do want my baby dogs to be healthy and happy, and listen to some extent (which seems to be the most I can hope for). So does she ring the bell randomly too or does she only do it when she actually has to go potty? Glad you found a solution, nice job! She knows that the bell is to go outside. She rings it and then sits there, amused, waiting for us to come running, praise her, and take her outside. We are well trained. She definitely sometimes just wants to play outside, I would say it’s about 70/30 of her actually wanting to potty vs chase imaginary squirrels. I am impressed! You are obviously dedicated to taking care of your babies and using proper training techniques. Thanks! 🙂 I love them so much. How could you not? You saw their faces! They are SO cute! They so know how to manipulate their people, don’t they? But they are worth all the hassle. Puppy kisses = heaven. I’m quite familiar with the Sheeba Scream after working in the veterinary field for 10 years. They are funny little dogs, that’s for sure. Looks like you’re doing a lot of incredible work with your two! So cute! 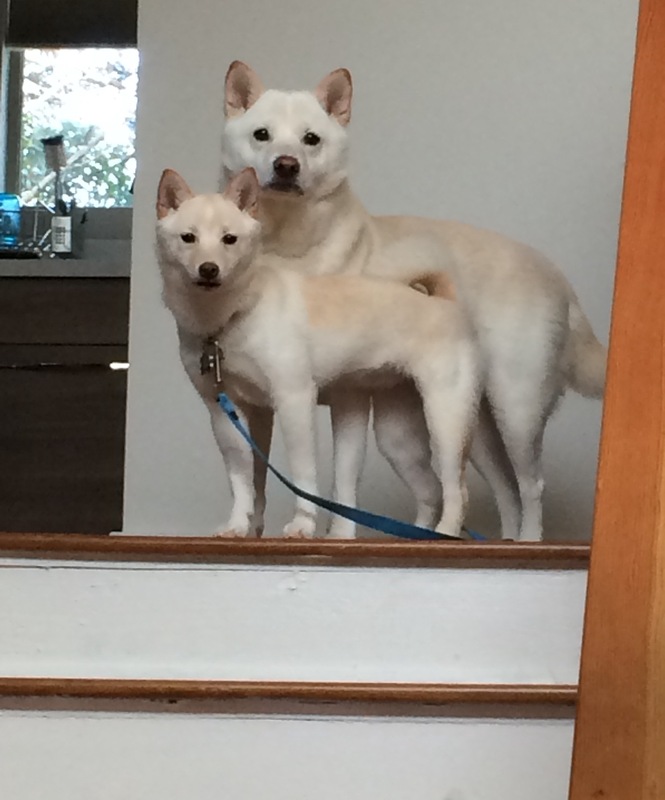 Were you afraid when you saw Shibas come in? 🙂 I love them so much, they are just darling and so smart. However… They’re even naughtier at the vet! When we lived in an apartment our dog would go patiently sit by the back door, that was his way of telling us he had to pee… There were times I’d look over and wonder how long he had been sitting there! LOL. Once we moved into a house, the first thing I did was get a doggie door! Aww, it’s nice that he would just sit there instead of going on the floor. Your pups are so cute! Oh my dog looks sweet and adorable, but he’s so stubborn! He’s a little over a year old and I’m thinking we should sign him up for obedience classes. He listens about half the time (unless you have a treat) and he tends to pull us along while on walks. Your dog is very cute, I’ve seen his pictures 💕 Obedience classes are great. I adopted my older dog when he was a year and a half and took him then. He learned so much! He still only listens when he wants to, but it taught us to communicate so much better.